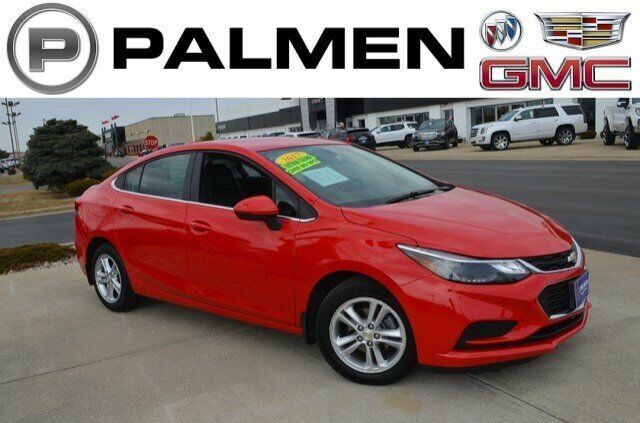 Red 2017 Chevrolet Cruze LT FWD 6-Speed Automatic 1.4L 4-Cylinder Turbo DOHC CVVT IPOD/USB PORT, BLUETOOTH, **ONE OWNER**, **ACCIDENT FREE AUTOCHECK**, **LOCAL TRADE**, **REMOTE START**, CALL OR TEXT JODI AT 262-748-8005, PALMEN BUICK GM CADILLAC ONLY 15 MIN FROM IL AND 20 MIN FROM MILWAUKEE, #1 RATED AUTO DEALERSHIP FOR CUSTOMER SATISFACTION IN 2015. Black Metallic 2017 Chevrolet Cruze LT FWD 6-Speed Automatic 1.4L 4-Cylinder Turbo DOHC CVVT IPOD/USB PORT, BLUETOOTH, **ONE OWNER**, **ACCIDENT FREE AUTOCHECK**, **REMOTE START**, CALL OR TEXT JODI AT 262-748-8005, PALMEN BUICK GM CADILLAC ONLY 15 MIN FROM IL AND 20 MIN FROM MILWAUKEE, #1 RATED AUTO DEALERSHIP FOR CUSTOMER SATISFACTION IN 2015. At Palmen Buick GMC Cadillac we want you to find the perfect vehicle, and we'll work hard to make sure you do. Simply tell us what you're looking for and when it's available you'll be the first to know! By submitting this form, you agree to be contacted by Palmen Buick GMC Cadillac with information regarding the vehicle you are searching for.